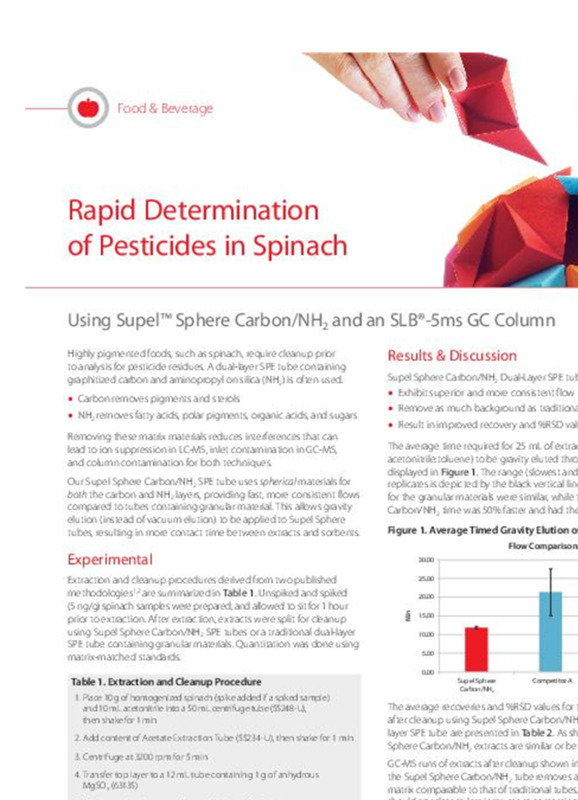 Highly pigmented foods, such as spinach, require cleanup prior to analysis for pesticide residues. A dual-layer SPE tube containing graphitized carbon and aminopropyl on silica (NH2) is often used because; Carbon removes pigments and sterols and NH2 removes fatty acids, polar pigments, organic acids, and sugars. Removing these matrix materials reduces interferences that can lead to ion suppression in LC-MS, inlet contamination in GC-MS, and column contamination for both techniques. Our Supel Sphere Carbon/NH2 SPE tube uses spherical materials for both the carbon and NH2 layers, providing fast, more consistent flows compared to tubes containing granular material. This allows gravity elution (instead of vacuum elution) to be applied to Supel Sphere tubes, resulting in more contact time between extracts and sorbents.